All objects are made of atoms. As any object gets smaller, more and more of its atoms are forced to the surface, and the surface area increases relative to the volume. The “glues” that bind one object to another at the atomic level are the chemical bonds between atoms. Thus, it is a natural consequence of constructing matter from nanoscale size grains that surface interactions increase dramatically and new materials properties emerge. 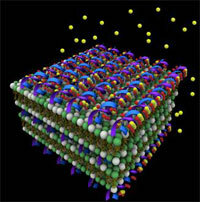 Metals, ceramics, insulators, alloys, thin film materials, and so forth that are made with nano-size grains can become stronger, harder, less brittle, better catalysts, and exhibit other surprising properties even though they are composed of the same atoms as their normal counterparts. This becomes extremely important for people who make materials to solve a particular problem because now they have a way to “engineer” materials with improved properties.